Molly Dushay shared this photo from here trip to the site. It is amazing the spartina growth. This shows that by re-establishing a breakwater, you can create an environment that the marsh grasses will return. November 8, 2013 – Connecticut Audubon Society and Sacred Heart University have been awarded a $59,000 Long Island Sound Futures Fund grant to construct an innovative “living shoreline” at Stratford Point, to improve critical bird and wildlife habitat and protect the state’s coastline from storms like Hurricane Sandy. 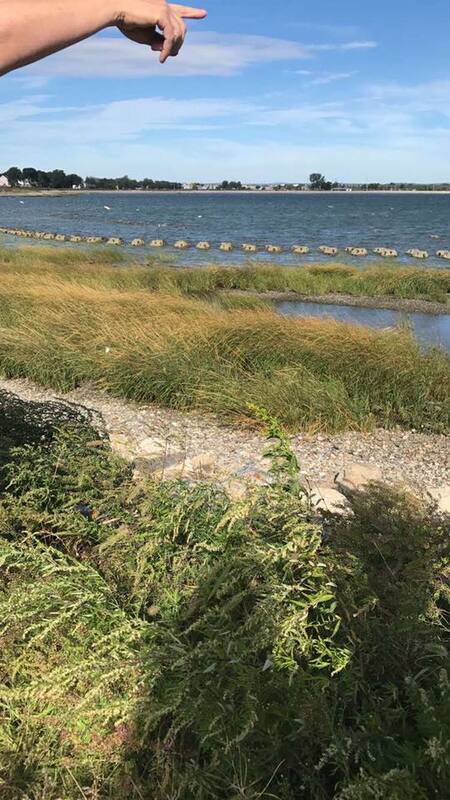 The living shoreline includes the construction of a reef consisting of 40 permeable concrete reef balls—a technology never before used in Long Island Sound— along with the restoration of a salt marsh behind the reef. The project will be constructed in roughly 3.5 acres of intertidal zone at the 40-acre coastal estuary restoration site at Stratford Point, which is managed by Connecticut Audubon Society (CAS). The project will test the living shoreline’s feasibility for use by other coastal communities for protection against hurricanes and storms, and for preventing erosion and other impacts of sea level rise. The living shoreline works by slowing down and breaking up waves and storm surges that cause erosion, allowing for sediment deposition and for protective tidal marsh plants to take root. It allows a natural community to emerge, providing habitat that acts as a fish and blue crab nursery and a hard substrate for shellfish settlement, and enhancing habitat for Great Egrets, Snowy Egrets, Black-crowned Night-Herons and other birds. It will help protect the newly restored upland coastal habitats that Connecticut Audubon and Sacred Heart, which is in Fairfield, have undertaken at Stratford Point over the past four years. This project will greatly improve its value as a key bird and fish habitat in the heart of the Housatonic River estuary. 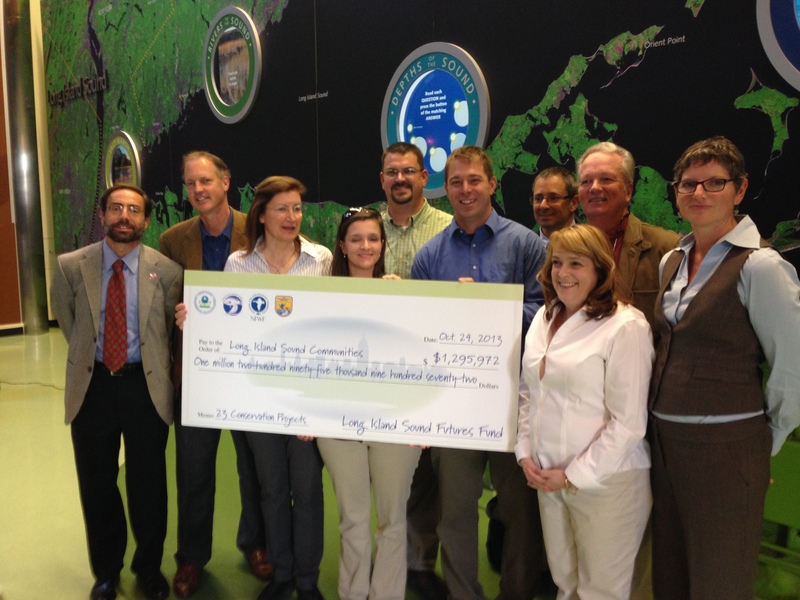 The Long Island Sound Futures Fund 2013 grant was announced last month by the National Fish and Wildlife Foundation. It was one of 23 Long Island Sound Futures Fund grants awarded by NFWF. Connecticut Audubon President Alex Brash said CAS and SHU were thrilled to be working together on a project that will improve natural habitat and protect the shoreline. Jennifer Mattei, director of the environmental science and management graduate program at SHU, said the project also will have educational value for people interested in coastal protection and ecology. “Once the reef and marsh are installed, the public is welcome to come and see how the reef is working,” she said. The reef balls will be installed in March or April 2014 by a team of SHU and CAS staff and volunteers. Living shorelines use a variety of structures and natural features, such as dunes, reefs and marshes, to protect fragile coastal features as well as shoreline property. These are in contrast to seawalls, rip-rap walls, bulkheads and other armoring structures which, at the expense of natural habitat, tend to harden and destabilize the shoreline, cause loss of beachfront and sever the biological link between the land and sea. 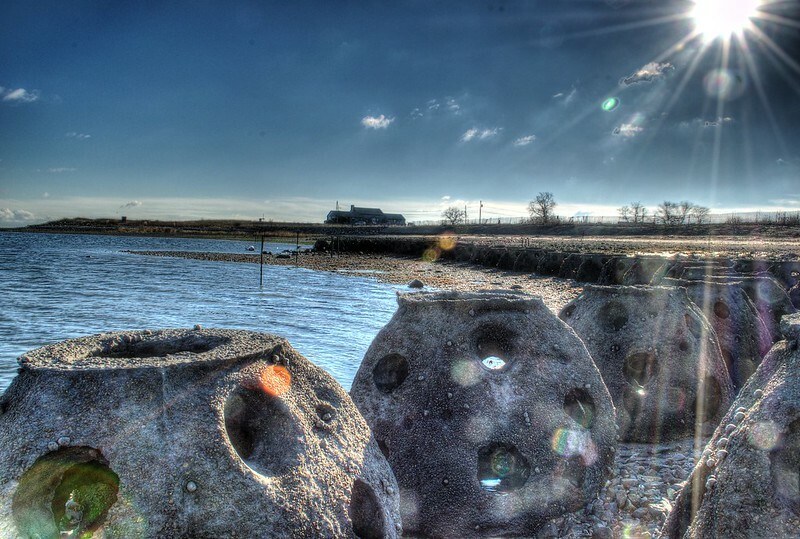 Using the NFWF grant, Sacred Heart and Connecticut Audubon will install 40 reef balls in Stratford Point’s north cove. Reef balls are dome-like concrete structures of various sizes. At Stratford Point, they will range from two feet tall with a three-foot diameter base to nine inches tall with a 17-inch diameter base. Each reef ball—manufactured by the non-profit Reef Ball Foundation—has Swiss-cheese-like holes to allow water, tides, sediments and marine life to move in and out. At Stratford Point, four sizes of reef balls will be installed in four rows of 10. To add stability to the area, a 60-foot-long biodegradable sock, filled with the shells of bivalves, will be snaked through the middle two rows of reef balls. The reef balls allow sand and sediment to settle near the shore, creating habitat for tidal marsh grasses, which themselves provide habitat for estuarine animals and added protection for the shore. The reef balls become habitat for fish and lobsters. Surveys in New Jersey found 14 species of fish, as well as American lobsters, inhabiting a reef ball area. The research team, led by Professor Mattei and Professor Mark Beekey, SHU scientists, two additional colleagues and graduate students, will collect data throughout the first year of the project to gauge whether it is successfully trapping sediment, enhancing habitat and protecting the point’s shoreline. After the first year, they will modify the design, if needed, and augment the reef, if possible, to maximize the benefits. Connecticut Audubon Society will be responsible for obtaining permits from the Connecticut Department of Energy and Environmental Protection (DEEP) and the state Department of Agriculture’s Bureau of Aquaculture. Anthony Zemba, director of conservation services, and Milan Bull, senior director of science and conservation, will oversee the project for CAS. SHU and CAS will provide their analysis to DEEP and the Department of Agriculture, and if the project is judged to be a success, SHU and Connecticut Audubon will seek funding to expand the project. Stratford Point is owned by Sporting Goods Properties, Inc., a wholly-owned subsidiary of the DuPont Company. The site is protected by a conservation easement held by the state and managed by the Connecticut Audubon Society. For much of the 20th century, it was the site of the Remington Gun Club. About a decade ago, DuPont completed a large remediation project to remove lead shot that had been left over the decades. To restore the Point, CAS and SHU have collaborated on several projects, including a controlled burn of almost 20 acres of upland to help control invasive vegetation and the buildup of thatch, and the planting of scores of native trees and shrubs to improve the point’s upland habitat. In 2011, a manmade dune stretching for 900 linear feet along the north cove was constructed. During Hurricane Sandy, the dune helped prevent major erosion of Stratford Point and other inland areas. Although the storm washed away the dune’s sand and vegetation, the base remained intact and the shoreline remained undiminished. The living shoreline will help protect the dune area, and DuPont, SHU and CAS plan to rebuild the dune next year. CAS and SHU look forward to continuing to work and learn together in ongoing projects that will restore our state’s shoreline, educate our students, and help protect our communities.